Concerto Grosso for keyboards, string instruments and cpu (to the Memory of Djordje Delibašić). I first heard some music of Stevan Kovacks Tickmayer in Gidon Kremer’s orchestral recital on Nonesuch, “De Profundis”. The program has its ups and downs, but Tickmayer’s composition, an elaboration after Bach’s Lasset Uns Den Nicht Zerteilen, was intriguing enough for me to want to explore more. Tickmayer, a student of Dutch minimalist composer Louis Andriessen, was born in 1963 in former Yugoslavia, and it’s a conundrum to define exactly his nationality: Yugoslavia doesn’t exist any more, and since he was born in Serbia I guess it makes him a Serb, but he’s from a Serbian minority of Hungarian culture, left the country with the outbreak of the civil war that would lead to its partition, never returned since to his home town of Novi Sad (where Milosevic has made his first call for a rebirth of Serbian nationalism), and has been established in France since, which is quite a long time now, but apparently he never acquired French citizenship. There’s a long and very personal autobiographical essay on his website. The CD is frustrating in that it contains no liner notes, no presentation of the composer and no explanation about the pieces. They are presented as three works but each apparently collates various compositions made at different times – in Concerto Grosso, for instance, the fourth movement, “Bugle Counterpoint”, dates from 1997, and the rest from 2006. In “Cold Peace Counterpoints” – titled unexplained, probably a pun on “Cold War” – the framing movements are from 1997 and the middle one from 2005. Same with the Five Bagatelles, fourth movement from 1995, the rest from 2006. 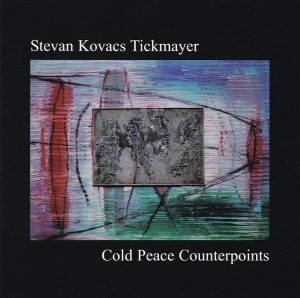 Tickmayer’s website doesn’t elucidate much – only one of the pieces, “Violin Ostinato”, the short (2 minutes) last movement from “Cold Peace Counterpoint”, is mentioned in his catalog of compositions. The CD’s credits aren’t helpful either to make out the instrumental lineup of each piece. Concerto Grosso is said to be scored “for keyboards, string instruments and cpu” (which I assume is “central processing unit”?) but no string ensemble is credited, so I guess whichever strings are here played by sampler or other electronic device. In fact, Tickmayer’s website describes the CD as “a solo CD project”, and on the CD Tickmayer is credited as playing “acoustic and processed piano, prepared upright piano, harmonium, keyboard & sampler, toy piano, el [??? What’s an el? First time I ever hear of that instrument. Click click! Wikipedia – disambiguation: “.el, a computer file extension used for Emacs Lisp source code”, really, you think that’s it? What’s Emacs Lisp source code? No, can’t be that. Search again search search – got it! Among the music samples offered by Tickmayer on his website, one uses an “el organ”, and google google google it seems to be a Yamaha electronic organ], guitar, double bass, voices, Hungarian zither, CPU”, but we’re not told what he plays in which piece. There are a few guest performers too, and so you know that it’s a real electric guitar that plays in “E-guitar Ostinato”, the first movement of “Cold Peace Counterpoints”, a bass (I suppose guitar) in the same piece and in “Violin Ostinato”, the last movement of the same cycle, and a real violin in the latter. What a “Polyhistor” is (in “Five Bagatelles for a Polyhistor”) is left unexplained – search search search: Wikipedia redirects from that word to “Polymath” – “The term was first used in the 17th century; the related term, polyhistor, is an ancient term with similar meaning”. Okay, so the piece is written “To the Memory of Bada Bada”, whom Tickmayer in a short note describes as “an extraordinary poet and painter”. Concerto Grosso is also dedicated to the memory of a close friend of Tickmayer, drummer Djordje Delibašić: “Both of them left and seeded deep trails in my artistic as well as esthetical visions, and without them, today my own music as well as many artistic views would be merely different and poorer for a great deal of two original and unusual minds”. With all those minutiae sorted out (yep, some CDs require active participation from the listener) – what about the music? 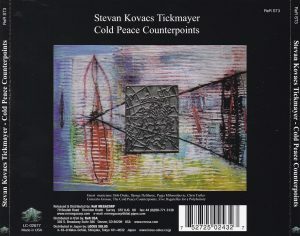 Straddling contemporary and (I guess) avant-garde rock, and fully into the latter in a piece like E-Guitar Ostinato for (if ear serves) electric guitar, bass, drums and electronics, the first piece from Cold Peace Counterpoints. Mixing electronics and acoustic instruments, but the acoustic instruments seem as distorted as the electronic sounds, prepared piano, electric guitar, and many others which I haven’t even tried to recognize. Rowdy, timbrally inventive, sometimes downright clowning in the Five Bagatelles (track 10), neo-Kletzmer in track 11, berserk boogie-woogie in 13, and track 14 a mixture of many things, from Tango to what sounds like Serbian rap. That’s where you realize that Tickmeyer and filmmaker Emir Kusturica come from the same country. Short TT of 49:24. At the time of writing this review, Tickmayer’s website hasn’t been updated since October 2015.